In our new house, the backyeard strip has come with what I'm almost positive are potatos that the previous owners must have simply thrown into the garden. Now, I don't know when these were planted, or sprouted. It's the last month of spring where I am. It'd be a shame to waste the plants, I was considering waiting until I can pull them up and using them before tossing the plant. But I'm hoping that won't be too far away, I really wanna get into weeding the whole bed. Can anyone tell me when these plants should be ready to pluck? You an grub for new potatoes a week or so after flowering. The potatoes will die back when they are ready to harvest. How long that will take depends on the variety and since you don't know that or when they were planted there is no way to tell. 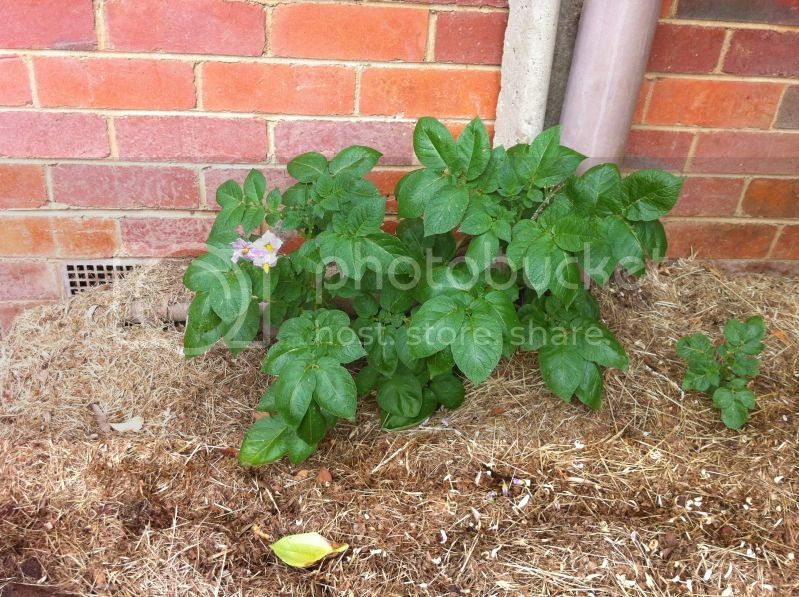 In my experience (which is with only a couple varieties of potatoes, grown in containers half a world away from you in totally different climate), going from healthy and just starting to flower like yours to when the plant dies back and you can harvest full grown potatoes, can be quite a long time, easily more than a month, maybe a couple months. As rkunsaw said, if you just want little baby new potatoes, you can probably get those in a couple weeks. Your potato plants are looking very healthy for something that presumably hasn't gotten much care for awhile while the house was changing hands. Congratulations on your new home! Thanks guys We'll probably pick them as new potatos. We did a big weed of the garden yesterday, and found so many more potatos! Mostly new ones, but there were a few large ones. So obviously some of the plants had been there a while! The one that's really close to the brick wall however, we've found it's actually growing INTO the wall. So I don't know how we're going to harvest that one! I guess it also depends whether you want to have mature potatoes or immature potatoes. You can just scrape the soil on the side so that you will be able to see if they are ready. You can also see it's time to harvest when above ground plants whither. I don't know the answer, but it does seem pretty small. I grow them in cut down old trash barrels (the kind you take out to the street for trash pickup), probably at least 15 gallons and at that I don't get very many potatoes to a container, maybe a dozen and none of them real big. 5 gallons for a potato crop is seriously not enough. try 15 or 35 gallon size. 5 gallons is to small. I have planted potatoes in 1/2 50 gallon metal drums. Layering soil as the plants grew. Lots of potatoes. We don't grow them any more due to space restrictions. Besides George is on a low/no carb diet so ptatoes are out anyway. When he is out of town I will treat myself to garlic smashed potatoes or homemade potato chips. Shame one me but I do love potatoes. At 59 years old, 128 lbs, normal blood pressure and cholesteral I treat myself when G is out of town. That is when I eat potatoes, pasta, and bread. I think I got off of the subject. Potatoes need lots of depth to grow. I had soil (albeit hardpacked clay) under the silos so you would probably need a raised bed maybe 10-12" deep. To the OP -- I hope you let your potato plants grow. Home grown potatoes taste so much better than store bought. Then you start looking around at the named specialty varieties.... Mmm, mmm! Try sunchokes in those 5 gallons. They make a lot of tubers even in small containers. I seen some guy grow several in 3 gallon containers and the whole container was literally packed. 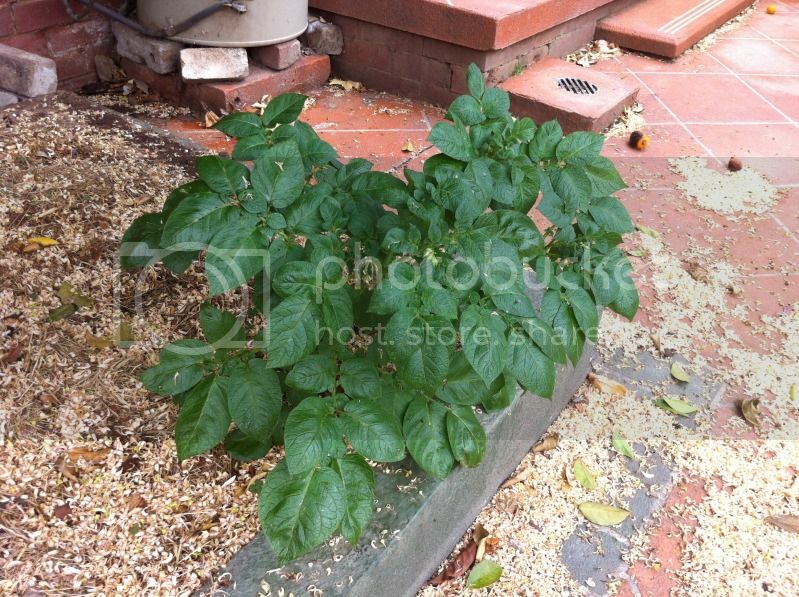 Well as I said you can grow potatoes in containers/towers, just not 5 gallon ones. If you don't have an old trash barrel around, they aren't that expensive to buy. Just put plenty of drainage holes in it. Can you steer me toward more info on this method? I probably explained it at length in that thread (I know it's a long one with other stuff in it) if not, let me know and I'll try to hunt down the thread that I did. I would have detailed it better when I did it. Basically chicken wire circle, seed potatoes about 12" apart directly on the bottom clay, topped/mulched with compost, sand, leaves, straw, hay as the shoots grew. Water well -- will dry quickly. Getting ready for spring markets. help? Getting beds ready for spring or let it grow?